Welcome to the first April 2013 issue of GL Communications' Newsletter. This week we discuss some enhancements to our versatile PacketGen™ - a PC-based real-time VoIP bulk call generator (both SIP signaling and RTP generation). Major applications include testing for stress, voice quality, digits, tones, voice files, and various codecs. PacketGen™ is based on a distributed architecture with SIP and RTP software cores modularly stacked in one or many PCs to create a scalable high capacity test system capable of generating 2000 simultaneous calls. PacketGen™ can be used to test basic functionality and verify proper protocol implementation in SIP based equipment such as SIP phones and Network Servers, Proxy Servers, Registrar Servers, and PSTN and Media Gateways. 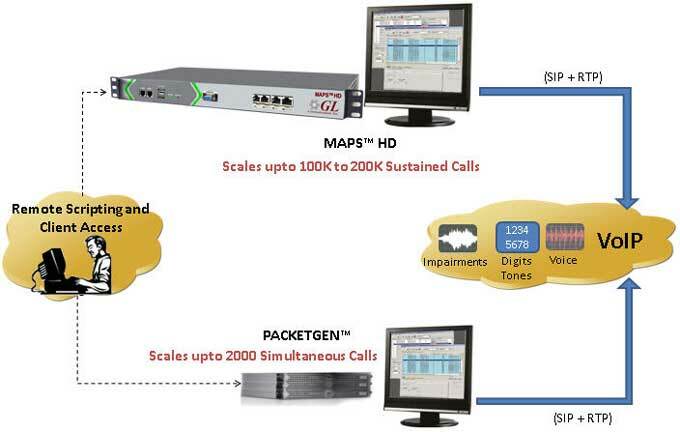 PacketGen™ on an i7 PC can now support 2000 simultaneous calls with both SIP and RTP generation. This performance is with a G.711 codec, while other codecs may provide higher call densities. The distributed architecture of PacketGen™ allows achieving higher call rates and media streams, and provides greater scalability i.e. easy to add additional load generation capacity. Additional codecs GSM-HR (Half Rate) and GSM-EFR (Enhanced Full Rate) are now supported. All supported codecs can operate with frame interval in multiples of minimum frame interval supported for the codec. For example minimum frame interval for AMR/AMR-WB is 20 msec, now we can operate with ptime like 40, 60, 80 msec. Provides option to enable or disable VAD for all VAD supporting codecs such as AMR, AMR-WB, HR and EFR. Calls support media re-negotiation and are updated with media parameter changes like codec, port indicated during Re-INVITE or during call Off-Hold. Now calls can process REFER, NOTIFY and INFO methods during call and are replied with 200 OK responses. Codec support for EVRC and EVRCB with Silence Suppression and G.711 Appendix II. RTP script editor feature helps users define multiple tones before monitoring receive tone action. The 'Tone Label' helps in identifying the type of tone detected. The user can trigger some actions like IVR applications based on the tone detected. The ability to send "reliable provisional responses" and start early media actions. We have two options in Reliable Provisional Responses Viz: Required and Supported. 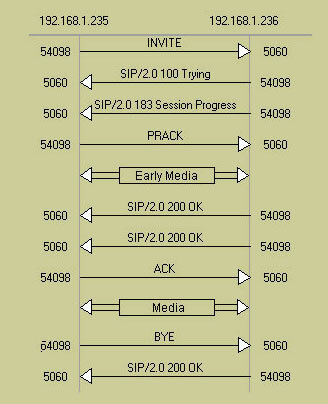 Below diagram shows a SIP call flow with RPR's and early media. We support both Time and Power qualifications for digit detection. The detected digit's On time or power MUST be >= to the value set by user for the digit to be detected. Option to Turn On/Off Sending of Out-of-band Digits in Signaling This option helps user control sending/detecting of outbound digit codec in the SIP signaling. If the option is set to 'true' then PacketGen™ can detect Outbound digits. If the option is set to 'false' the application cannot detect outbound digits. Command line helps set/reset the required or supported flag. It has also been modified to read the G726 Packing Type from the User Agent configuration automatically. The application supports both LSB and MSB packing for EVRC payload. User can choose the value by editing the appropriate (RTPConfig.ini) file. G726 packing type has been moved from SIP Call parameters to Media parameters. G726 codec options dialog displays the Packing Type. Default value is set to RTP. For more information on the features available, please refer to the PacketGen™ web page, or give us a call.